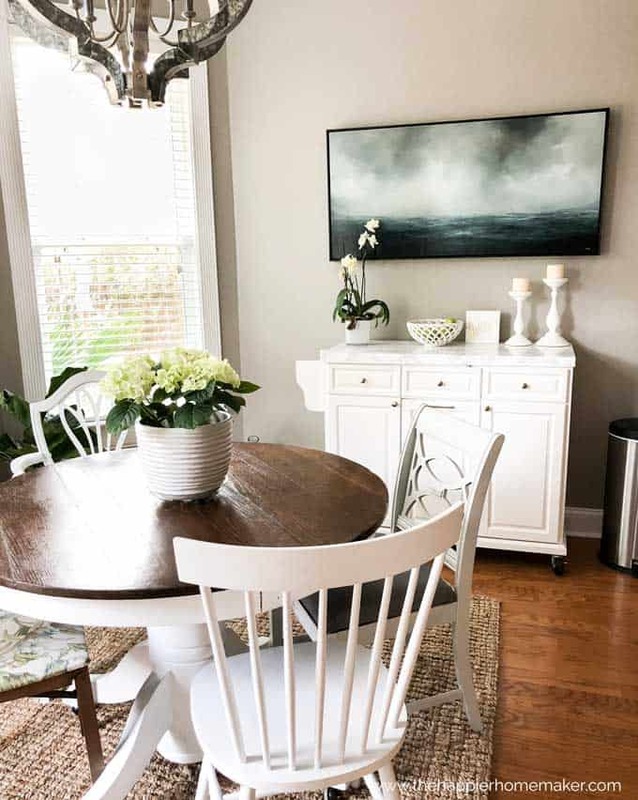 A few weeks ago I shared a picture of the eat-in area of our kitchen on Instagram because I felt it looked a little to dark or heavy at one end of the room and wanted suggestions. 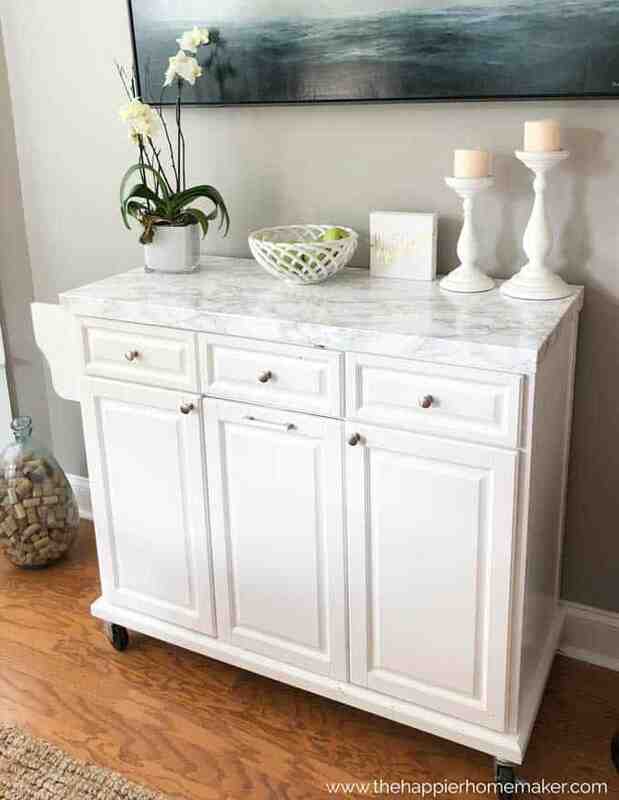 Today I’m super excited to show you how we updated an old kitchen island we had with an easy DIY Faux Marble Countertop and how much it helped lighten up the room! I guess I had mentioned the “too dark” thing a time too many to my husband because in the middle of me cooking dinner one day he started emptying out the server and told me it was time to move it. I desperately tried to convince him that no, it was not time to move one of our largesdt pieces of furniture in the middle of dinner and kid’s homework time but the man is relentless. And his idea of what to put in it’s place? 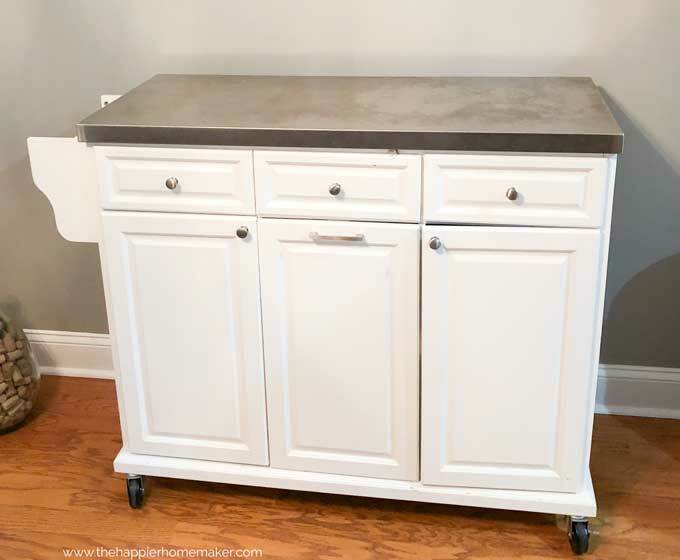 This kitchen island on wheels I used to keep in my old craft room that was currently serving as a catch-all storage piece in our laundry room. 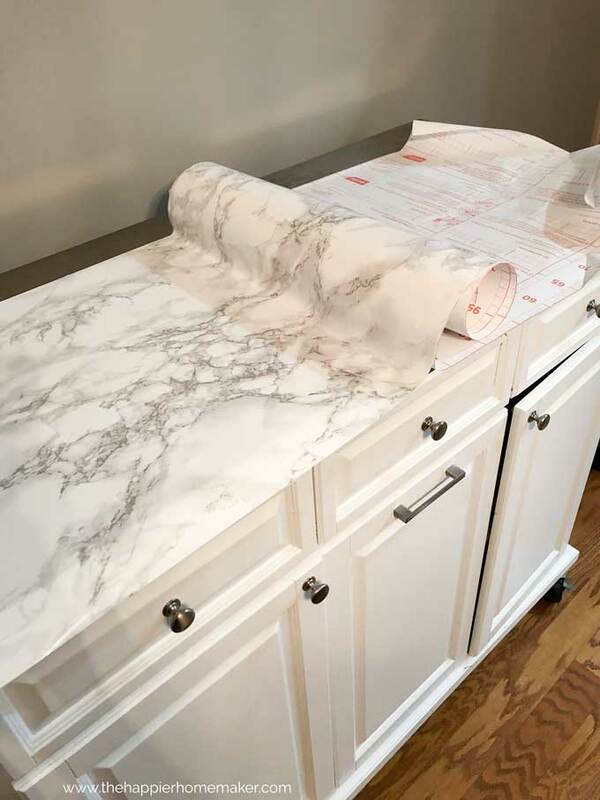 My contact paper was not as wide as the counter on this island so I decided to put the line in the back knowing that I would have various decor items set back there to hopefully disguise it. 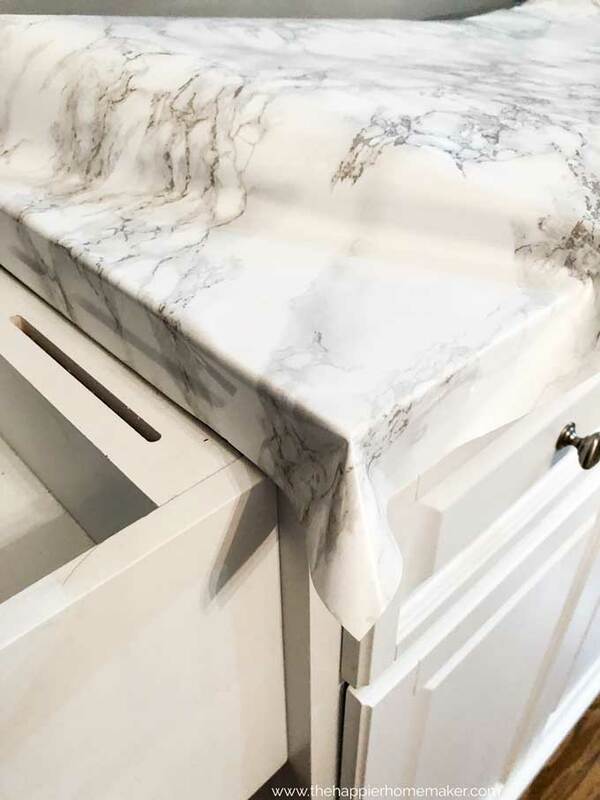 I lined up the edge of the paper as closely as possible to the bottom front lip of the counter, erring on the side of too much rather than too little and slowly began to peel it off the backing while pressing on it with my forearm to apply it as smoothly as possible. I’m not going to lie, it wasn’t perfect. I did the best I could to work out any major bubbles and prevent wrinkles but it does have some imperfections, luckily the pattern makes them hard to see unless you’re looking for them and the light is just right. At the corners I cut the paper on the back side and carefully folded the front around. 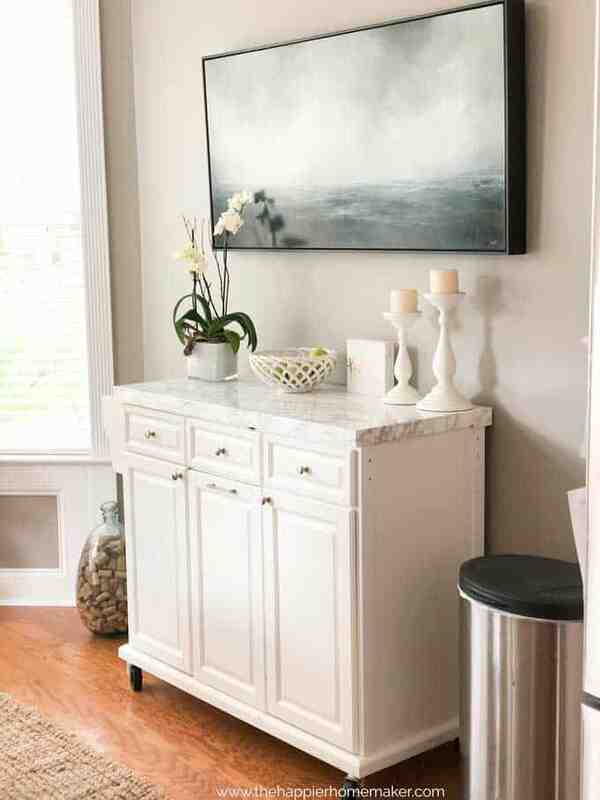 The big takeaway here is that it’s not perfect but it works well enough, even in this space that is used a ton in our house. I couldn’t be happier with the way it turned out! We also switched out the artwork above with this piece by Adam Hall from Robert Lange Studios in Charleston (one of our favorite galleries we try to visit often!) I love having it here where I can see it every day! So what do you think of the lightened up space? 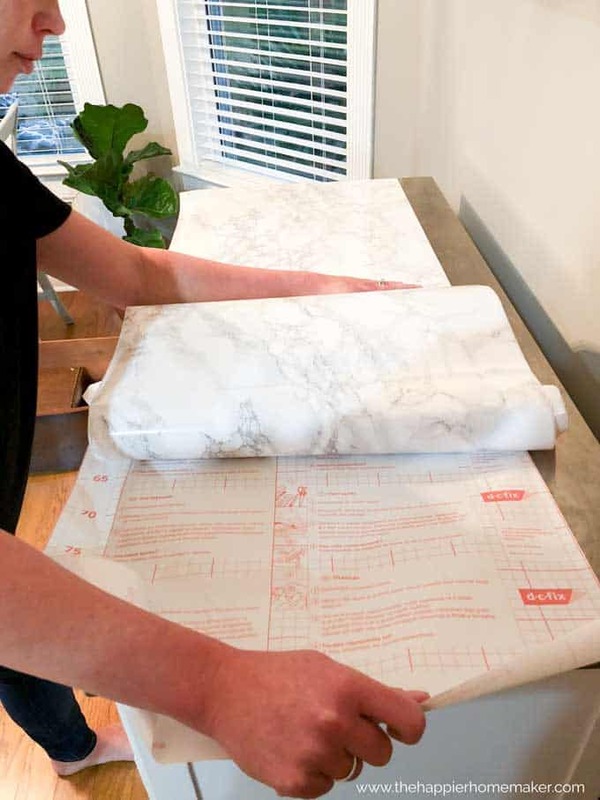 Would you try this DIY Faux Marble Counter in your home? I definitely don’t regret it for this space, but it works here because it’s a display area rather than a functional countertop. I love it though! What do you think about putting poly over it? 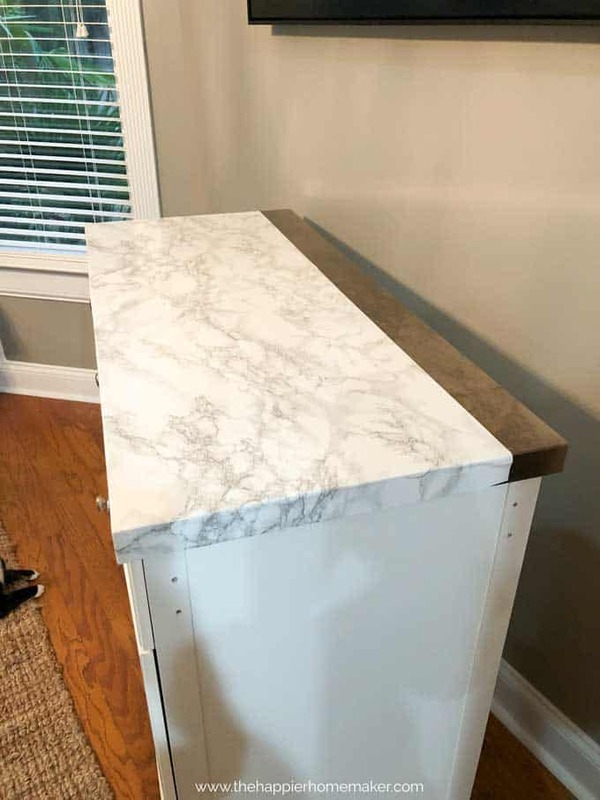 I want to do my kitchen cabinets.